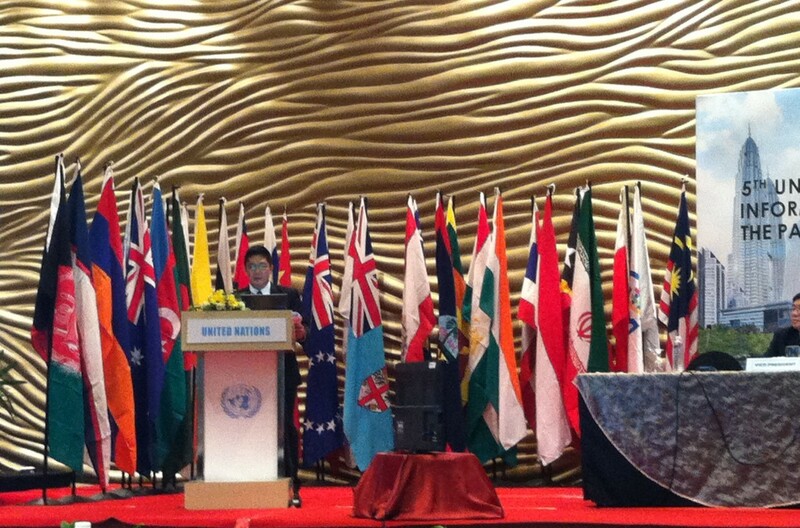 Geospatial Information System Management Branch Director John SF Fabic presented the “Strategic Framework on Geospatial Information and Services for Disasters 2016-2030” at the plenary meeting of the United Nations Global Geospatial Information Management of Asia and the Pacific (UN-GGIM-AP) in Kuala Lumpur, Malaysia on 17 October 2016. The annual regional meeting of Member State representatives and other international organizational leaders coincided with the three-day International Forum on Policy and Legal Frameworks for Geospatial Information Management. Director Fabic represented NAMRIA Administrator Dr. Peter N. Tiangco as co-chair of Working Group on Geospatial Information and Services for Disasters (WG-GISD). The presentation is one of the global consultation activities of the working group that aims at gathering support for the strategic framework leading to its endorsement by the UN Economic and Social Council (ECOSOC) to the UN-GGIM Bureau. Director Fabic appealed to the home base region to contribute to the further improvement of the strategic framework as this will eventually become the UNGGIM’s guiding policy document for crafting each Member State’s national implementation plan on using geospatial information for disaster risk reduction and management. The Philippines also joined the meeting of the AP Working Group 2 (WG2) on Disaster Risk Management chaired by Japan. The areas of collaboration and complementation between WG2 and WG-GISD were discussed. A possible expansion of the existing survey conducted by WG2 among AP Member States was considered to include a rapid assessment of the indicative status of each Member State relative to the five priorities for action of the strategic framework. This may be presented as a joint report of WG2 and WG-GISD in the 2017 regional meeting in Japan. At the conclusion of the plenary meeting on the third day, the Philippines made a statement of support to the committee resolution especially citing the proposed action plans by WG2. Information System Analyst Rosal Dolanas also participated in the meeting and forum as a member of the WG-GISD from NAMRIA.